After reading Rinchen Dolma la’s post I felt more relaxed, like a weight had been lifted off of my shoulders. Hearing her talk about her experiences did something for me that is usually acquired in private conversations. It made me feel like I was not alone. It was like I was sitting with her just as I had last year when we last saw each other, talking about the struggle to feel accepted not speaking Tibetan or not speaking perfect Tibetan. It was a realization that others have this experience too and that this isn’t an isolated experience. For as long as I can remember I have not understood Tibetan. It’s a terrible thing to admit but it sounds like a foreign language to me. I did not spend much time with my father growing up and he is my only parent who is Tibetan. My mother is Kalmyk Mongolian and I spent my childhood growing up with her family in New Jersey. I had heard Tibetan during different times in my life, but it was never constant. Learning how to speak Tibetan always felt like an insurmountable task that I had to learn how to live without. Then something changed. I started to become more active in the Tibetan Freedom Movement. I started having Tibetan friends and a Tibetan boyfriend. I started spending more time with my father and I went to India for the first time. Going to India was the first time I ever felt embarrassed not speaking Tibetan. I was 14 years old and was scolded for the first time for not knowing my language. At the time I just felt bad. I didn’t know how else to feel or what to say. But the person who scolded me made me promise to come back to visit them next time speaking Tibetan. They didn’t ask why I didn’t speak Tibetan or how I could try to learn. They didn’t provide any resources. They just demanded that I speak it. As Rinchen la mentions in her post, this is most likely done with a positive intention. Since then I have had more experiences like that and all of them end in the same way, they don’t really try to get to know me or my experience. They don’t provide real help or answers how to magically learn Tibetan. It hasn’t been these encounters that has made me want to learn Tibetan but recent realizations within myself. I am realizing now at age 23 that I could be getting married soon and have children and that I might not be able to understand my children. I may lose something very special with them because I don’t know how to do something or how to say something in Tibetan. Recently I had an experience with my boyfriend’s nephew who is a toddler learning how to speak Tibetan and English and he started saying things in Tibetan that I could not understand. We looked at each other and I felt like he was wondering if he had made something up or if I just couldn’t understand him. After that moment he looked discouraged and in my gut I felt like I was somehow messing with his language development. Instead of listening to people who try to shame me, I started listening to my own fears and realizations that I am missing out on something. For those who want to learn how to speak Tibetan, especially those that are complete beginners like me I really recommend the Esukhia classes that are taught through Skype. This Tibetan language school is based in Dharamsala, India and teaches classes to students around the world. I take my class every Monday morning before work and am able to manage this class with all of my other responsibilities. Each class is about $5 US. I started writing about taking my Tibetan class on Facebook and actually found a friend who has the same teacher, so we message each other letters of the alphabet to help us learn to read better. This was an easy, accessible way for me to learn and it has become a shared experience because I started writing about it. The person I practice with was more of an acquaintance that I met very briefly. She is at a much more advanced level than me in Tibetan. 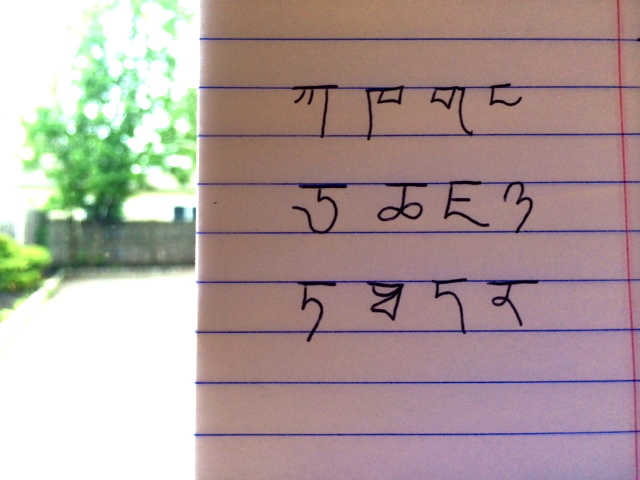 As a way to help me she messages me letters to read in Tibetan. Her action is one that actually aids me in the learning process rather than scolding me for not knowing something automatically because I am called Tibetan. The shaming technique never worked for me. If anything it made me not want to speak Tibetan. But staying connected with myself did work for me. I hope everyone reading doesn’t let the shaming technique keep you down or make you feel any less Tibetan. I know and you know that there are circumstances that are out of our control that keeps us from learning, it’s called displacement. It can be being a mixed Tibetan and having divorced parents, or not spending time with your Tibetan family, or going to school away from Tibetan people. It can be a lot of things. The question now is where do you want to go in your learning, given your situation. And how do you create a conversation about finding those resources. What we do next is up to us. You know though, people do that shaming thing. It is just part of the culture. My boyfriend from Rebkhong used shame all the time. It is one of the reasons I left him. My friend, a lady whose parents are Tibetan, she grew up in India in a Tibetan community, she didn’t learn Tibetan. Everyone gave her crap for it. It is just their culture and they don’t think about how to help. As a kid it is hard to blow off adults. It is something most kids are not taught to do and it is hard because they don’t have the emotional skills, even as a teen, especially as a teen. I’m not Tibetan. It has taken me years to learn Tibetan. I speak it well enough to converse with people but it is not perfect. You keep on plugging along. As a suggestion, also look at how your shame effects you. For me, my shame manifested as being shy and terrified around native Tibetan speakers until I met my boyfriend. That shame was replaced by joy, but it took time and inner work. I still feel nervous speaking to anyone but my friends, but I have that trouble with English and often fall over my words. Hang in there. Big hugs!!! I know how you feel. My mother’s tongue is Polish and I had little or no communication skills and what I did have was very easily misunderstood and I was often ridiculed. I lived in Poland for 6 years and there a learnt a lot of my own language. I also met a lot of wonderful people, one of them taught me this saying: My in Polish is good in Polish. (Moje po polsku jest dobre po polsku.) Which technically, is incorrect, but it’s a humourous play on words which actually makes you and the listener realise that really, what’s important is, that you CAN understand eachother… even if it takes a little time and a bit of ear tuning (mostly from their side). I’m never ashamed of my language anymore. I make a joke with that little saying and people are more often than not, able to understand where I’m coming from. Most Polish people were just happy I had made an effort in the end! Shaming is an Asian culture and is deeply ingrained in Tibetan. No wonder Tibetans student will hesitate to ask question. Many a times teachers or superior will berate you and often tell not to ask stupid question. But in the West there is nothing such as “stupid question”.